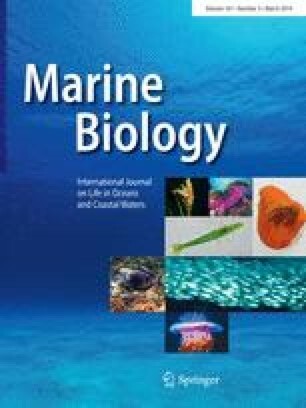 Large Atlantic halibut (Hippoglossus hippoglossus) off the eastern coast of Canada were tagged with pop-up satellite archival transmission tags (N = 17) to track movements, determine ambient depth and temperature, and infer spawning activity. Many halibut showed seasonal movements from deepwater slope areas in fall and winter to shallower feeding grounds on the Scotian Shelf and Grand Banks in summer. Halibut depths ranged between 0 and 1,640 m. Mean temperature of occupation was 4.7 °C. Multiple short-term vertical ascents from a consistent baseline depth, characterized as spawning rises, were identified in seven of the tagged halibut south of the Grand Banks. All presumed spawning rises occurred in multiples of 2–6 events at 2- to 9-day intervals between October and January, spanning an average vertical extent of 50–100 m at depths of about 800–1,000 m. Given the direction and velocity of the slope water currents and the duration of the pelagic stage, the calculated 300–500 km drift of the eggs and larvae would take them onto the Scotian Shelf, as well as into the Gulf of St. Lawrence. Therefore, the location of the presumed spawning grounds is consistent with expectations based on migration compensation theory, the northeasterly migratory patterns of the juveniles, the relatively static distribution of the adults off southern Newfoundland, and the prevailing currents at depth. This work was funded by the Department of Fisheries and Oceans International Governance Strategic Funding and the Atlantic Halibut Council. The authors acknowledge and appreciate the support of commercial halibut fishermen Frank Reyno and Andrew Locke for successfully deploying the tags. Warren Joyce and Anna MacDonnell provided expert technical assistance. We also thank Dave Brickman for helpful perspectives on the deepwater circulation patterns. Andrew Seitz, David Righton, and two anonymous reviewers provided helpful comments on the manuscript.